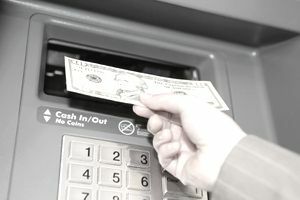 When you need cash you can usually just turn to the nearest ATM, but ATM owners and your bank typically place limits on the amount you can withdraw. These daily limits could prevent you from withdrawing more than a few hundred dollars in any 24-hour period—with $300 to $500 being the most common limit. Those limits help in preventing large losses due to theft while protecting the bank—and you personally. If unauthorized withdrawals go unnoticed for too long, you may be responsible for the charges, and you'll have little chance of recovering the stolen cash. However, if you need to make larger daily cash withdrawals, you may be able to get a temporary increase in your daily limit, or you can use a debit card cash advance to withdraw funds. This will come in handy if your car breaks down and a private seller will only accept cash to purchase a used automobile. As soon as life throws you a curveball, call your bank and ask them to temporarily raise your ATM limit. They may ask you to provide certain information (such as a driver's license) to prove your identity, but you might be able to have your daily limit increased as high as a few thousand dollars. You won’t always have success requesting an increase, but you have nothing to lose by asking—it's not as though you're taking out a loan and incurring interest. This is a good option because ATMs limit the maximum withdrawal per transaction, so you may need to go to several ATMs and incur multiple ATM fees to get what you need. Although most ATM limit increases are temporary, you might be able to get a permanent increase if you frequently need more than the maximum. Here are some alternative options if you don't like using ATMs. Debit card advances: If you can’t visit a teller at your own bank, go to a different bank. Ask about using your debit card to get a cash advance, which allows you to withdraw more cash than ATMs allow. Banks typically charge a modest fee for the service if you’re not a customer, so find out how much it costs before you go this route. Credit union customers: If you use a credit union, you may have even more luck. Many credit unions participate in shared branching, which allows you to make free withdrawals from your account using other credit union branches nationwide. Different credit unions have varied hours, so look for a location that’s open when you need it. For example, evenings and weekends. Cash advance limits: Debit card cash advances at branches still have limits, but they’re generally higher than limits at your local ATM. It's worth noting that any withdrawals you already made at the ATM will probably also count against your daily in-branch limit. Regardless of the method you use, keep an eye on your bank account balance, in case you withdraw money that you had already committed to auto-pay bills or monthly rent payments. A store may approve a cash-back transaction that causes you to have insufficient funds and incur fees from your bank. You can also try to get cash back at grocery and convenience stores. You can buy something small, such as a $2 toiletry, and get as much cash back as possible. Most stores limit cash back to relatively small amounts, such as $50, but that amount combined with the maximum you can pull from the ATM might get you what you need. If necessary, you can use multiple cash-back transactions until you hit your debit card’s daily purchase limit, which may be several thousand dollars or more. However, you’ll likely have to endure the inconvenience of visiting several different stores and securing cash in small increments.